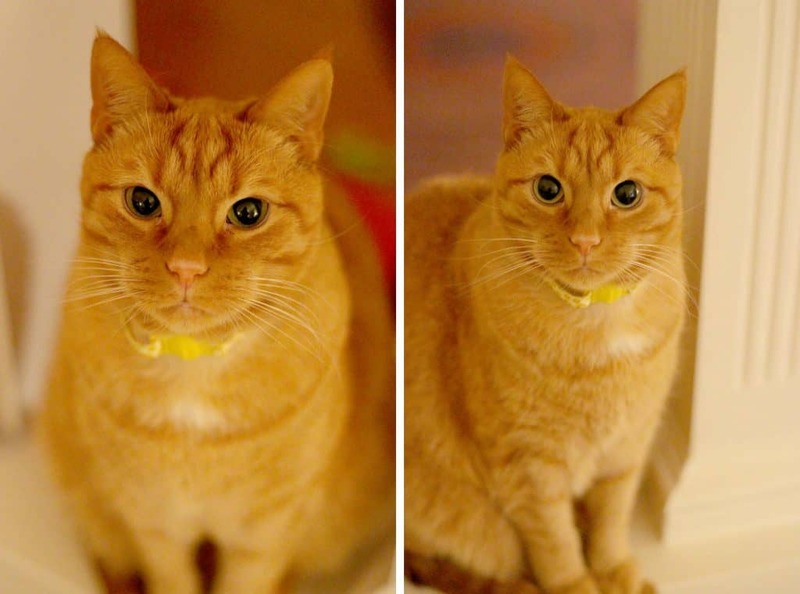 January 24, 2015 By Elizabeth Lindemann 8 Comments / This post may contain affiliate links. I don’t know where to start with this post. I’m at a loss. 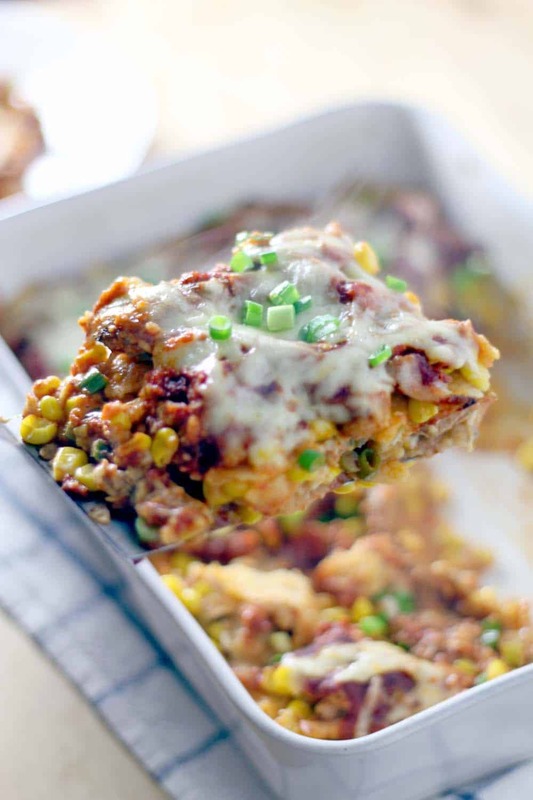 There are just SO many delicious and amazing things happening with this chicken and corn enchilada casserole! 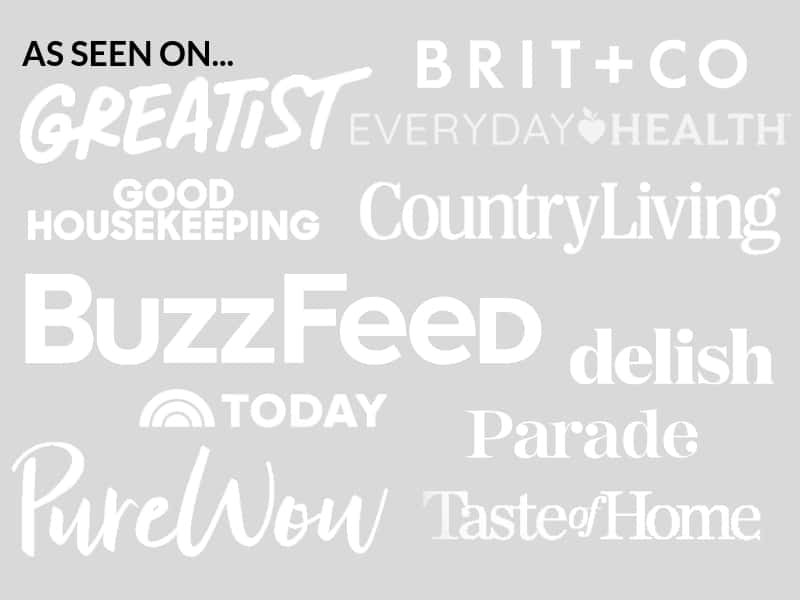 I’m simultaneously torn between figuring out what to write about first, and wondering if I should go to the grocery store in the middle of this snow storm to get the ingredients to make it again RIGHT NOW. At 7 in the morning. Because we ate all of it, and this makes me sad. It’s just so, so, amazingly tasty and comforting. And it’s SO easy, it’s freezable, and it makes for great leftovers. It’s perfection! Even though I am sad that our enchilada casserole is no more, I am VERY happy about a few things. First of all, Zach and I are hunkering down all day today because of the snow. Which means making banana pancakes and bacon for breakfast, experimental cooking and working on the blog, and playing with my NEW CAMERA LENS! OK, enough blabbering about non-casserole related things. I’ve thought about it, and I’ve decided that I’ll start with how easy this is to make. First of all, it uses only six ingredients: enchilada sauce (I make my own and freeze it in bulk), corn tortillas, frozen corn, green onions, chicken (I used my smoky Mexican pulled chicken, my go-to for Mexican chicken recipes, but you can use leftovers from roast chicken or any other kind you want), and cheese. That’s it! And, as if chicken enchiladas weren’t easy enough, an enchilada casserole requires no tortilla rolling, which can take some finesse. This casserole is layered much like a lasagna, but instead of cooked noodles, you use corn tortillas! Easy peasy. Just start with sauce, then tortillas, then corn and scallions, then chicken, sauce, and cheese. Repeat and bake. Done. The hardest part about this is waiting until it is finished baking to eat it. The texture and flavor of this casserole is simple but delicious. 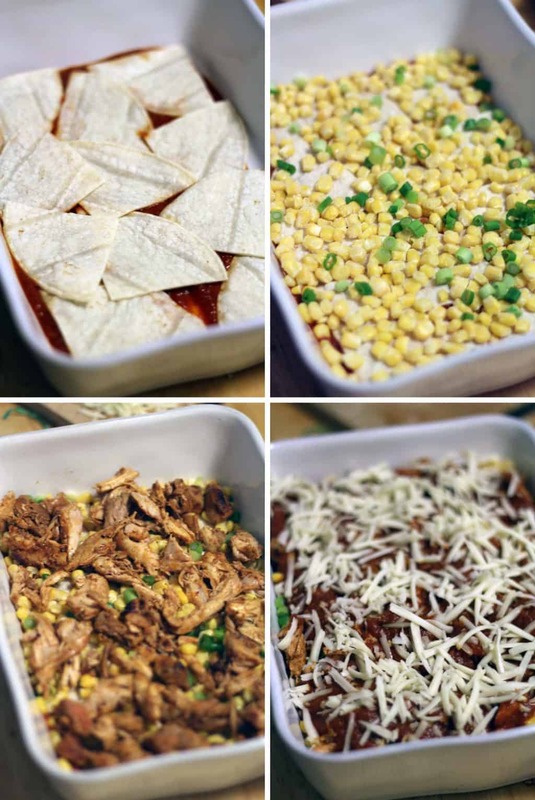 The corn tortillas don’t hold up to the baking- they kind of dissolve into the casserole, which is a good thing! They form these layers of delicious, creamy corn flavor that you get with every bite (kind of like a tamale), in addition to the whole corn kernels. The green onions add a subtle savoriness to the casserole, and the chicken stays moist and delicious, soaking in the flavors of the sauce and onions and corn. With melty cheese on every bite, there really is nothing better. It’s comfort food at it’s finest. If you are vegetarian, I recommend substituting seasoned black beans and sweet potatoes for the chicken, like in my sweet potato and black bean enchiladas. YUM. 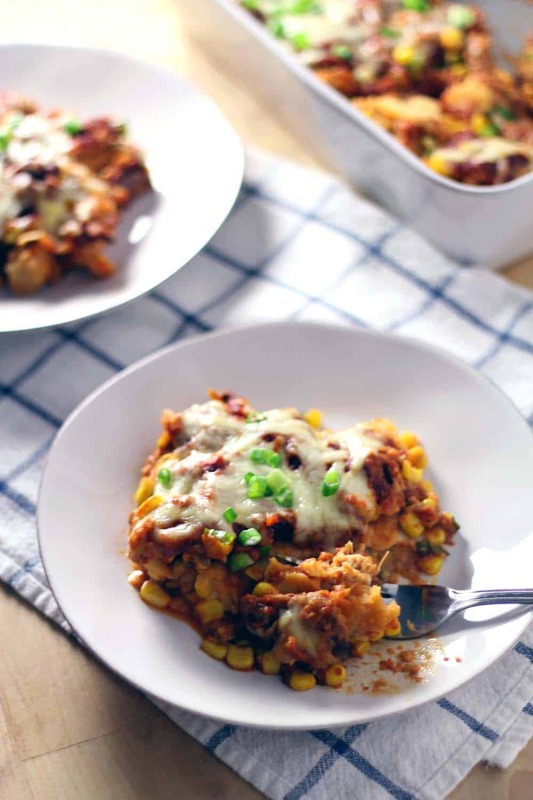 With only 6 ingredients, this chicken and corn enchilada casserole is simple, delicious, and easy to make on busy weeknights! In a casserole dish, spread 1/3 of the enchilada sauce. Top with 1/2 of the corn tortillas evenly. Add 1/2 of the frozen corn, topped with 1/3 of the scallions, then 1/2 of the chicken, and 1/2 of the cheese. Repeat layers starting with the remaining tortillas, and ending with the remaining cheese. Bake for 20 minutes, or until heated through and beginning to brown on top. Vegetarian? I recommend substituting seasoned black beans and sweet potatoes for the chicken. Make ahead- assemble ahead of time and refrigerate for up to 3 days until you are ready to bake. 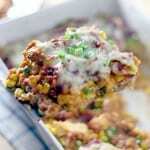 Freeze assembled casserole for up to 6 months in an airtight baking dish. Defrost in refrigerator for 24 hours before baking. Is there a good substitution for the cheese, my husband is off dairy? Thank you, you are so helpful and quick to respond! This is delicious! I have now made it twice with Elizabeth’s enchilada sauce and smoky Mexican pulled chicken. Soooo yummy! Thanks so much! I ALWAYS make this in double, so I usually have one in my freezer. It’s one of my faves! This sounds sooooooo good !!! !